Geofencing is a technology that offers a variety of different uses for businesses of all sizes. Using GPS technology, these “virtual boundaries” are activated when certain devices enter or depart the particular area. Among other things, companies can use this technology to improve marketing, make the workplace safer and to reduce wage fraud. However, as is the case with many transformative technologies, geofences are also the target of criticism and concerns relating to privacy. Some of these complaints are warranted, while others are the result of misinformation and confusion. There are typically two important considerations that arise when determining whether or not this innovation is right for your company. First –– and most obviously –– does it help your business? Second, how can it be implemented in a way that does not come at the expense of privacy (of both workers and customers)? Geofencing provides a major benefit to employers with a large number of mobile employees spread out over many job sites. A company that has workers at multiple sites may frequently struggle to track the location of its employees. This can have serious implications in terms of accountability, payroll and safety. Large construction companies, always looking for ways to reduce injuries, are using geofences as a way to keep tabs on workers on job sites. They can set up these perimeters around unauthorized areas as well as ensure that an area is cleared of people before conducting a dangerous blast operation. Builders can also establish virtual boundaries that are activated if a piece of heavy equipment leaves the site, which can help prevent the loss of valuable property that is frequently a target of theft. The technology is also a major benefit for employers trying to more accurately track employee hours. With a timesheet app like Timesheet Mobile, an employer can easily set up a designated perimeter around any number of worksites. 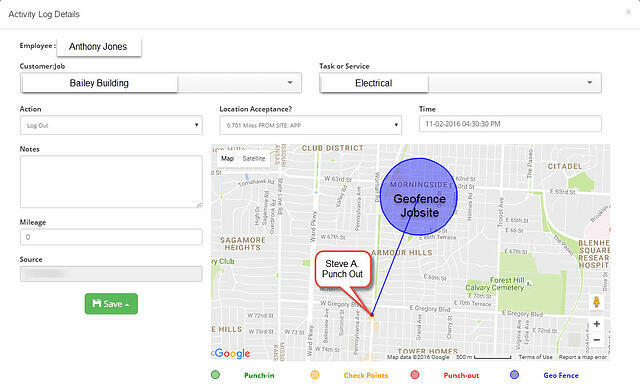 Since every employee has the mobile timesheet app on their phone, the employer is automatically notified when someone punches into the jobsite. This notification is also triggered as soon as they leave the site. This type of innovative technology means that employers can rest assured that workers are actually on the site for the hours they are supposed to be working. Rather than depending on employees to submit paper timesheets to supervisors, the GPS time clock on every worker’s phone automatically clocks them in and out (or at least notifies them to clock in and out). Using location-based applications is just one of a number of advantages that businesses gain by switching from a traditional, paper-based time tracking system to a mobile version. Above all else, putting this type of automated system in place dramatically reduces the time and money that your company spends tracking employees. No matter how small your business, tracking employee time and location can be a costly, cumbersome endeavor if you’re still relying on old methods. Finding the best use of precious marketing dollars is a perennial challenge in business. It’s practically impossible to know whether the money spent on a billboard or a newspaper ad produced a positive return on investment. In recent years, however, many companies have turned to virtual perimeters as a way to target customers who are most likely to be receptive to their pitch just by virtue of their location. Retailers can identify perimeters around a mall or another designated area. If a person has that retailer’s app on their phone, they will receive a push notification alerting them of a sale when they enter the geofenced area. Many retailers are also opting into broader networks of consumers that use geofences to direct users to a wide variety of stores. Perhaps the most prominent example is RetailMeNot, a popular smartphone app that alerts users about exclusive deals at nearby stores. Because customers redeem the deal using the app, it is easy for the store to measure the success of the marketing strategy. In a tight labor market, in which businesses struggle to recruit qualified candidates, some employers have turned to location-based services as a way to connect with people who are likely to be strong job applicants. A number of employers have used this technology to significantly boost the number of qualified candidates who are responding to job announcements. For example, a hospital in need of neonatal nurse practitioners purchased a list of people most likely to be qualified based on public data and then “set up a wireless fence around key areas where the coveted nurses live or work.” When the nurse enters the designated area, a job ad is pushed to his or her mobile device sharing details about a job opportunity. A trucking company in Salt Lake City did something similar, setting up areas around truck stops or other places where experienced drivers were likely to show up. Not all geofencing services are alike. It’s important that you choose a GPS time clock that will not intrude on employees’ personal lives. Timesheet Mobile’s employee time tracking app does NOT follow workers once they have left the geofenced area. It only tells the employer whether the on the clock employees are on site or not. Therefore, the employee does not have to worry about their boss knowing where they are during their free time. Just as important as protecting your employees’ privacy is making sure your workers understand that you are doing so. You must take the time to explain to them that their activity outside of work will not and cannot be tracked by the GPS time clock that you are putting in place. Otherwise, their suspicions may fester and result in low employee morale. Some businesses might not see a compelling reason to invest in GPS-enabled systems at this time. If you run a small business with a handful of employees at a single location, you may not have trouble tracking your employees and their hours. However, as your business grows and you're adding more employees and potentially new locations, keeping track of your staff will likely become much more challenging. At that point, you might want to reconsider geofencing. And just like many other sophisticated business technologies, it is likely to become even more cost effective and versatile in the years to come! Interested in learning more about how geofencing works and how it can be used for your business? Check out our .